Who don’t know about the famous Angry Birds game these days? 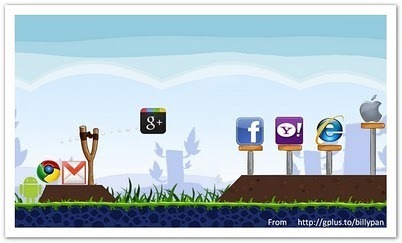 Here is a parody of Angry Birds version from Google. Pundits are thinking that Google Plus is going to give the missing Social Edge to Google. Lets see how common users are going to accept Google Plus once its open to all. Did you apply for early access to Google Plus? can i have it in large size for my desktop wallpaper…?